As decent a port as Raiden Trad is, the coolest thing about the game for me is its name. Back when it came out I had some access to arcade machines but I didn't have a deeper understanding about them or anything related, and it would take years for me to find out the name of the series was just plain Raiden. So Raiden Trad always felt like the definitive title to me, and to this day it rings better in my ears than the original, somewhat generic Raiden. One of the several conversions that came out during the 90s, Raiden Trad for the Mega Drive is sadly also one of the most underrated shooters on the console (at least that's how I perceive the general feeling towards the game). I believe this has something to do with the old-style graphics, the well known slow speed of the ship and the checkpoint-based system, which is the main gameplay change from the arcade original. The resulting high level of challenge is probably to blame for turning off casual players from digging deeper into what the game has to offer. For years I've been wanting to finally beat it but at the same time I dreaded the checkpoints, a fear originated from past experiences and from playing the game on the EASY difficulty, the default setting. Yeah, I know… I was young, I was uninformed. Hard choice: weaving through the pattern or using the last bomb in stock? In a nutshell, the gameplay revolves around getting power-ups for two types of weapons: red (vulcan) and blue (laser). They're not selectable, and can only be changed when the next power-up appears. Then there are the missiles: straight (M) and homing (H). And then there are the bombs, which influence the end of stage bonus in conjunction with the number of medals collected. This is exactly the same basic structure found in the arcade version, which I explained in full detail when I wrote about the Playstation port. Raiden Trad on the Mega Drive has only minor, insignificant gameplay differences, such as the value you get when uncovering and grabbing the miclus (5.000 instead of 3.000 points) and an assumed toning down of the laser's and straight missiles' power. Because it's a checkpoint shooter, dying during boss fights will reset the number of flags/medals collected, thus considerably reducing the end of stage bonus. For some people the lack of a 2-player simultaneous mode might be a serious drawback, not for me though. As for other aspects of the game, there’s no denying Raiden Trad bears a remarkable level of faithfulness to the arcade version. I noticed only very few (maybe 2 or 3) medium-sized enemies are missing, while everything is graphically pretty close to the original, down to enemy placement and boss patterns (some of them are actually tougher). The soundtrack takes the biggest hit but still manages to convey what the game is all about musically. Sound effects are sort of a mixed bag, yet I'm really fond of those slightly muffled explosions you hear when the missiles hit something. The screen gets a little bit jerky when a fully powered vulcan weapon is tearing everything apart, but in general the scrolling is fine and fluid. Reminiscent of early Toaplan vertical shooters, it's important to mention that this game shares the same reputation they have for being very difficult. Dying in later stages with no fairy recover in stock makes it almost impossible to go on, even if it resets rank - which makes things nasty if you play well enough and don't die. One of the features that makes the Mega Drive port a bit special is the extra stage included by Micronet after the end credits roll. This is hands down one of the hardest challenges ever posed to a gamer in shmup history. Unless you beat the last boss (stage 8) while preserving all power-ups there's no chance you might ever be able to see the end of this extra 9th stage. In case you're wondering how it plays you can check this video, recorded in the HARD difficulty with the aid of save states. I don’t usually care to write about game covers, but in the case of Raiden Trad I feel forced to say that the Genesis version is just hideous. I’m very proud of my Tectoy variant, just check out how awesome it is. Notice how it sort of turns the Japanese art upside down. Beautiful! I'm a materialistic person. I like the feeling of concreteness, the awareness of being able to touch something. I believe what my eyes see and what my logical sense regards as truth, and that applies to gaming as well. Until recently I had a strong grudge against downloadable games. I would not download or play them at all despite having all resources at hand, and I kept thinking of all possible downsides of dealing with virtual media - availability, longevity, support, ownership - while avoiding them as if they were the plague. But guess what? I changed my mind. And to start my path towards virtual enlightment, what could be more appropriate than a free game, one that can be had for no money provided you have an Xbox 360 and an Internet connection? Aegis Wing is the answer. The story of this game is an odd one. The core material was all developed by three Microsoft interns during summer time, being later polished by Carbonated Games for proper release, probably as a flagship of the possibilities involving Xbox Live Arcade. It has remained there as a free download ever since, but only for the North American market. That's not such a problem for people living in other continents, since it's perfectly possible to bypass these stupid region restrictions with a little bit of research. Simple and straightforward, Aegis Wing has completely old school gameplay. Kill everything, no need to worry about scoring mechanics because there are none. The absence of intrincate features is an indicator of the game's humble origin, but it doesn't mean it's devoid of any fun factor. There's no hectic dodging or overly flashy explosions, but the laid back tone is perfect for a gaming session where you don't want to concentrate that much on what you're doing. And if you've got a shmupper friend, join him/her in multiplayer and attach ships to unleash some neat firepower. I haven't done that and I can't do it online because I refuse to upgrade to a gold membership, so my experience was restricted to single player only. In this mode, that tiny smoking ship has only one main weapon, a pee shooter that can't be powered up and has a limited (although not useless) autofire rate. The only power-ups available are limited special attacks that come in four flavors: heat-seeking missiles, laser beams, EMP bursts and temporary shields. Each icon gives 4 of these attacks, which are only cumulative when you take icons of the same type. Since you can stock only 8 special attacks, if you have 6 in stock and a new icon is approaching feel free to fire away 2 of them before getting the replenisher. It's possible to change the color of the ship every time a stage starts, and this color change is also applied to the special attacks. One interesting aspect of the game is that stages 2 and 4 have no bosses. Even though you're informed of your shooting statistics when a stage ends (shots fired, enemies killed, destruction ratio) there are no related bonus points. 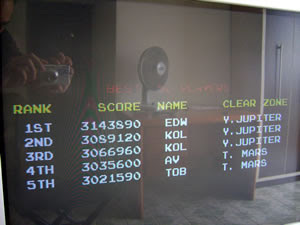 When I tried searching for scoring techniques online I came accross a few exploit tips that pointed to some time consuming methods of getting high scores, basically involving the milking of rocks and popcorn ships from bosses. I believe this was doable during the time the game was released, but it just doesn't work anymore. Enemies or debris yield absolutely no points during boss fights. This is wonderful because it provides for fair high score competition. Too bad the online leaderboards are cluttered with inflated old scores. Experienced players and sci-fi geeks might identify some references and homages during gameplay, and I've got my own impressions to share. The first one is the graphical resemblance to Border Down in most of the background art. If you've already played G.rev's awesome shooter then you know what I mean. Another reference appears in the design of some bosses, which is definitely inspired by the sentinel creatures of the Matrix movie series. They all have that same organo-metallic aura in the way they move. The EMP burst special weapon is also akin to Matrix stuff, even though you can't use it on bosses. I would even say the Matrix reference extends to bit parts of the epic soundtrack, in evolutions that could've been composed by Don Davis himself. Aegis Wing is an easy game, with a rather limited range of enemies. What makes it easy in the NORMAL setting is the fact that you always start a stage with 5 lives, independent of your stock when finishing the previous stage. However, in the HARD setting (dubbed "INSANE") you're only given one life per stage, which means one life per credit. Each life has a health bar that can withstand 3 hits and is refilled by the cross icon - collisions are fatal though. Performing well in any of the available modes is a matter of learning how each special attack works (the laser is able to crush indestructible mines, bullets deflected by the shield can damage enemies) and how to tackle each enemy/boss pattern. This one had been lying around for a while and I wanted to play it to finally get a notion of what everybody calls an euroshmup - even though my copy is the Japanese, not the European one. X2 - No Relief is always brought up in any conversation related to this dreaded term, which is in most cases used with a negative connotation towards the game labeled by it. When released in the Japanese market, X2 received a few trimmings in order to make it less "euroshmuppy", and therefore the Japanese version is considered to be the easier and most accessible one. Trimmings aside, I assume the core experience still remains the same. X2 is the sequel to a game called Project-X, released for the Amiga, but they seem to bear no resemblance with each other besides being scrolling shooters. 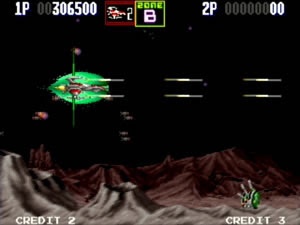 The graphics in the first stage of the Playstation game immediately reminded me of Einhänder, though they lack the polish Squaresoft's shmup masterpiece is well known for. This impression vanishes as X2 progresses, being replaced by the more obvious similarities in music, for electronica/techno is the word in X2's score. I like some of the tunes, and I wouldn't mind getting the soundtrack CD for my collection (assuming it exists, of course). Fighting an alien invasion is the character's main mission, as shown in the rather lengthy animated intro. It's possible to choose between 3 available ships with different characteristics for speed and power, but all of them will have to go through lots of power-ups in order to achieve the required firepower for each stage. Power-ups are released by certain enemies and come in 4 cycling distinct icons: main weapon, missiles, side shots and shield/energy/speed. Now this will please players who complain about losing their power-ups when dying: in the Japanese version of X2 you never - EVER - lose your power-ups. Even the speed remains the same when you're respawned. There's also an energy bar for each life, and on top of that this bar gets replenished whenever a new stage starts. Every power-up needs to be obtained a few times (2 or 3) in order to reach its full power. Getting a maxed out power-up will cause a minor explosion that damages enemies nearby, in a smaller version of the bomb attack. By the way, bombs can only be stocked up to 3. You always get extra bombs when defeating bosses, so there's no need to refrain from bombing during boss fights. Up to 4 Gradius-like small options will also be integrated into the ship's firepower, and their formation can be selected at the press of a button. There are some interesting aspects in X2's gameplay. One of them is how the different power-ups are distributed. Newly acquired main weapons are never lost and can be selected at any time. However, just like missile and side shot upgrades, you don't get them all up front. They are all scattered throughout the game. 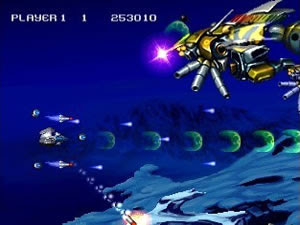 The beam weapon, for instance, only appears in the 4th stage, as well as the icon for auxiliary side shots. The final weapon (twin) is only released during the 6th stage, and only then you can use the shoulder buttons in the controller to adjust its opening angle. Instead of being depleted by a certain number of hits, the shield has a limited lifespan, during which you can ram into anything in the screen without losing energy. Getting the shield icon requires special attention though. The cycling order of the icon is shield/speed-up/energy/speed-down, and taking the wrong one in the wrong place can be disastrous to an otherwise mighty hitless run. To sum it all up, gameplay in X2 relates strongly to brute force: simply power up the ship as fast as you can. An unwise selection of power-ups is the main reason for the loss of a credit. Being hasty and careless equals failure, while patience and attention often leads to a pleasant and massive destruction campaign. All of this contributes to make X2 a mildly strategy-laden ride, one that will turn the ship into an impressive powerhouse by the time the game reaches its last stages. X2 - No Relief is a bit long. There are 10 levels in it, but luckily they are varied enough to avoid boredom. Scrolling alternates between horizontal and vertical during gameplay, which is a cool touch I'd love to see more frequently in the shoot'em up world. There's an end of stage bonus, but there are no special scoring techniques whatsoever. Last but not least, it's important to mention that the game unfolds without a single ounce of slowdown, even in co-op play (as seen in the attract mode). 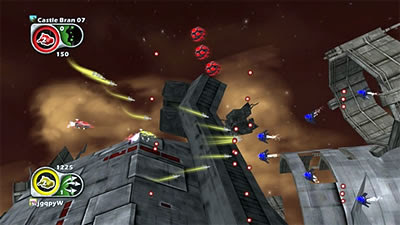 Most of the aspects of the euroshmup definition are strictly subjective, such as a presumed mediocre level design, unbalanced difficulty and complicated controls. The only objective checks I see against X2 - No Relief are the presence of a health bar and the granting of stage passwords (unique ones, no complete saving, starts with a pre-defined power level). Those who use the term extensively say the health bar is used to mask bad level design, but I don't think it applies here. Maybe to a few sections, but the overall result is decent enough. Truth is that bad design can be found anywhere. It doesn't matter where a game comes from, fun and frustration can be had with all sorts of different styles and settings. 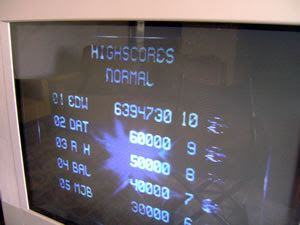 The high score below was achieved on NORMAL difficulty. I also did it on HARD (enemies get more resilient and you take more damage when hit), but with a lower score. Want to know a curious thing about this game? It was slated for a Sega Saturn release, but we all know it never came to be. The single oldest memory I have of being attracted to a shmup comes from this little game. I was probably 12/13 years old when I saw this TV show that aired stuff about new releases in video games, and I clearly remember how amazed I was when I watched a brief footage of Astro Warrior. That tiny ship dodging a series of bullets shot by a huge boss, an image that was so cool and yet so out of my reality, seemed like an awesome deal of fun. My old Master System console would never have the chance to run this game, simply because for all local rental shops the SMS library consisted solely of stuff like Alex Kidd, Double Dragon and Shinobi. That means quenching my desire to play Astro Warrior would only be possible after growing up. Better late than never, isn't it? It's extremely easy to ditch this game at first sight. It looks primitive, shallow and derivative on the outside. We all know that, as the underdog system and forever in the shadow of the mighty Nintendo's NES, the Master System severely lacked third party support throughout its whole lifespan. This forced Sega to develop most of the games themselves from ground up. 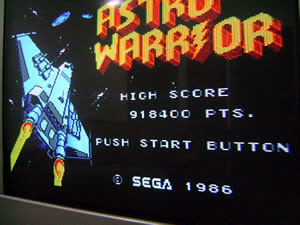 Astro Warrior was part of the initial development batch, and the influence from other vertical shooters of the time definitely shows. Everybody says it reminds them of either Zanac or Star Soldier, and everybody's right. The good thing is that, despite the simplicity of the title, Sega was capable of pervading it with a pleasing atmosphere and an overall tone that considerably heightens the seemingly lame fun factor. It's a fairly decent use of the 1 Meg cartridge, and I can't help but wonder what Sega could've accomplished had they given more ROM and development time to the game. 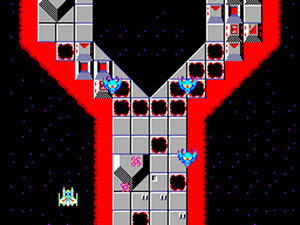 In Astro Warrior, a lone spaceship fights a series of incoming aliens in three vertical stages. As such, there are three bosses that must be beaten. 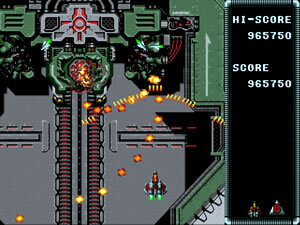 In order to increase the ship's power, the player has to destroy a certain number of ground targets to get icons for speed, power-up and up to two Gradius-like options. All these icons come floating right in the middle of the screen. There's nothing more than that as far as gameplay goes and, although the game feels a tad short and easy, the difficulty in the second loop increases dramatically. Recovering from a death during the 2nd or 3rd stages of further loops is a difficult task, and that's where the real challenge is. Powering up again is tough, so try to make the best of all extra lives obtained through scoring (for every 50.000 until you reach 200.000 points). There are some details that contribute to the charm Astro Warrior possesses among those to have it in high regard. One of them is the name of the stages, as well as the bosses. First there's the Galaxy Zone, protected by boss Zanoni. Then there's the Asteroid Zone, guarded by Nebiros. And finally we have Nebula Zone and final boss Belzebul. Whenever a boss is beaten, a blinking message saying "SURELY REVIVE *BOSS NAME*" warns the player that the defeated enemy might somehow return, which in fact happens in the next game loop. Each zone/stage has its own BGM and carries a very specific set of enemies, in a touch of variety that demands a distinct gameplay style/strategy for each one of them. Though not outstanding in any way in the graphical department, one minor distinction here is that the ship's sprites "evolve" with each power-up icon collected. Gameplaywise, Astro Warrior is also notable for not having any sort of enemy approaching from the lower part of the screen. None. If you want to just lay back and pretend you're in a Space Invaders environment, help yourself. The only real letdown while playing the game is the lack of an autofire function, so I seriously recommend getting one of those Rapid Fire units in order to enjoy the blasting in its full glory. Dear Master System owners, I urge you not to let the lack of flashy effects or the reduced number of stages mislead you. Despite all its shortcomings, Astro Warrior presents fluid gameplay in a simple albeit flawless execution. In the end, it's an addictive shmup that excels in two very basic concepts that a shooter needs in order to be good: (1) it's a lot of fun and (2) it encourages the pursuit of higher scores like few other games do. Definitely one of the best in the system. My new high score represents a considerable improvement of 250% over the last one I had. This time I was able to reach loop 5-2. "Reactions on the rader ! 3rd and 4th thrust engine, ignition ! Main engine energy level, 20% increase ! I always wanted a thing called tuna sasimi. And that's the narrated (and subtitled as is) introduction to Darius II on the Sega Saturn. It's displayed as the Silver Hawk approaches the surface of the sun, against one of the greatest BGM intros ever composed in shmup history. From the many existent home ports for this game, this is one of the titles that preserves the intro from the arcade (the other being a deeply hidden PS2 version), a treat that makes that special rush provided by the games we love the most even more special. I have a tendency of turning back to a Darius game whenever I have the chance. On the Saturn, I always felt my high score in this particular chapter could be improved, and this time around I aimed at nothing less than the 1-life clear. And those who have played it a little will concur when I say this is no easy task. Forget about the cakewalk of previous games and ports, this is where the series pulls its claws and delivers some serious, hard as nails challenge. There's no wimpy spacefish this time, all bosses from the 4th stage on are tough bastards ready to take your Silver Hawk down. Bringing the 2-screen experience of the arcade game to a home console just wasn't feasible, so Taito came up with a gimmick for the Saturn port. While the regular view is close to a widescreen presentation in order to replicate the arcade feel, several degrees of smooth zooming can be achieved on the fly by using the shoulder buttons on the controller. In a neat and impressive effect, it's possible to see all sprites up close when zooming in to the fullest. 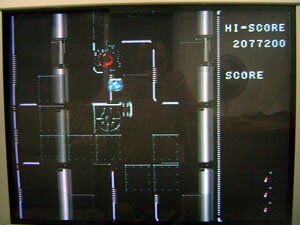 However, doing this causes the player to lose sight of what's going on ahead of him, while the screen will wobble considerably when moving horizontally. I's cool for showing off, but not the least acceptable during a serious credit. That's why the game should always be played in the default zoomed out aspect ratio for maximum scoring/survival purposes. Amidst all the main shot, bombs, laser and shield power-ups you need to collect in order to be able to deal with the increasingly harder enemy waves, in Darius II for the Saturn weaving through bullet spreads and claustrophobic passages is turned into an exercise on methodical gameplay. Every stage demands profound mastering if you want to get through it without a single hit. The vulnerability feeling you get when you lose the precious shield in later stages is unparalleled, simply because the danger lies in every little corner of the large playfield. Popcorn enemies are the worst menace, they sweep by so fast and shoot so relentlessly that escaping the swarms with no shield requires stunt after stunt. The slow speed of the Silver Hawk is designed for minimalist dodging as opposed to wider displacement streaks, and is actually the one to blame when you think about where the high level of challenge comes from. 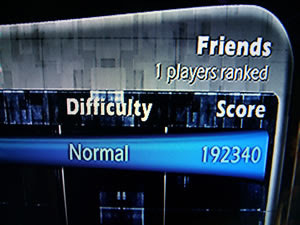 Another aspect of the game that influences difficulty is rank. I thought it wasn't that important until I managed to consistently pass perfectly during the N stage while still getting a few hits from boss Leadain. Now here's what I found out: in this stage there is a bomb/missile power-up just before the turtle captain. Take it and you'll face a harder Leadain. Miss it and Leadain will give in easier. This is a fact, I assure you. And this slight reduction in rank seems to cascade to the next stage and the battle against Grand Octopus, another hard beast to dispatch. In any case, rank is only reset when you die, but unless you are in the last stage it's pretty useless to continue playing. Unless you get totally in the "zone", Mr. Octopus will surely deplete your life stock as if you were an insect. One year after debuting in the arcade scene, the spaceship known as Vic Viper found its way to the NES in one of the first ports of Gradius, a landmark in the history of scrolling shooters. In order to lure more players into this new venue, the North American NES cover proudly stated the game had sold over 1.000.000 copies in Japan. Such marketing strategies weren't really needed after all - the NES, as well as other video game consoles available at the time, was still in need of new, fresh titles, especially shoot'em ups. And for the great 8-bit game it actually is, the NES version of Gradius ranks very high within the NES shooting library, or any NES collection for that matter. The reason Gradius for the NES plays so well relates to how clever Konami was when scaling down the original game to the hardware constraints of Nintendo's console. The game is simplified in such a way that it rarely pushes the platform beyond its limits, and as a result it competently retains all the key aspects that make it a timeless classic. It's a better approach than, let's say, what was done with R-Type and Sagaia on the Master System, two ports that suffer from well-known graphical problems (especially the latter). I was spending a Saturday afternoon reorganizing my collection when I stumbled upon this game and thought to myself it would be nice to try and top my previous high score on it. So there I went blasting big cores, moais and tentacles. Since recently I was able to beat the supposedly arcade-perfect Sega Saturn version, this time I could measure how much relatively easier the game is on the NES. Before someone starts complaining, remember that I said relatively, OK? The gameplay remains the same, as does the always familiar power-up bar. Get orange icons to cycle the positions in the bar and activate it to get the power-ups. As usual, the most important of them is the "option", the glowing orb that follows the ship around and here can be accumulated up to 2 instead of 4. 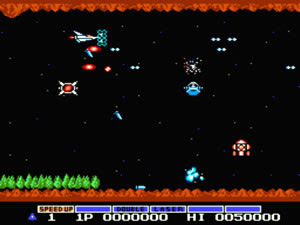 This is probably the main difference from the original game, but other noteworthy ones are: (1) the laser weapon is not a continuous series of laser streams anymore, being replaced by short laser-like shots with the same destructive effect; (2) stages and enemies are substantially scaled down (mirror stage is much simpler, big cores are smaller, the large cage in the final stage is missing); and (3) the shield now protects the whole ship against enemy shots, not only its front. 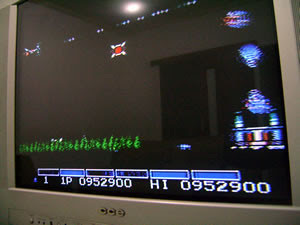 Everything considered though, the most important aspect of all in the NES Gradius is that it runs smoothly with almost no flicker at all, and the only bad thing one could bring up about its performance is in stage 5, when having more than one tentacle on screen almost brings the game to a hault. Well, given there's no built-in autofire and it's so damn hard to kill those tentacles, the slowdown sort of helps to at least avoid them. Some sources will even say that the stage 2 warp rule applies to any big core boss in the game, later levels included. I couldn't verify that myself though. Actually I personally dislike these warps, since they take away a lot of the scoring you normally get from playing the game as a whole. But wait... That isn't the end of the secrets! Hidden 1UPs and bonuses of 5.000 points are scattered all around, just take a peek at the Strategywiki page on Gradius to see where they're located and how to get them. On a side note, regular extra lives are awarded with 20.000 points and then for all hundreds afterwards. All NES owners deserve themselves the fun provided by Gradius, shmuppers or not. It's more intense than the average 8-bit shooter, with the right level of challenge thanks to the option-based rank, smooth scrolling and fair hit detection. The next shooting experience to be had after this is Gradius II.